It’s the 48th week of the year and the card of the week is the 8 of Cups. 5 appears 3 times this week so we’re looking at a 555 vibration hanging around. Repeating 5s drive home the point that well be faced with a lot of challenges that may make us want to throw our hands up and say, “I’ve had it.” So the 8 of Cups appears to remind you that if you feel like it’s time to go, then it’s time. It’s the week is 48th week of the year which breaks down to 3 in numerology. So even if it feels that nothing is going your way, things are actually coming together. Mantra: When things are feel like they’re falling apart, it’s really because they’re falling into place. 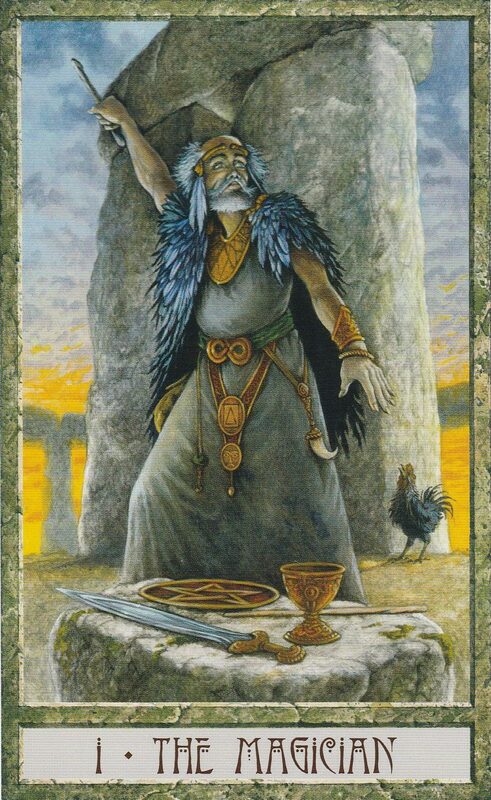 The King of Pentacles is traditionally a successful man with the “Midas Touch”, but he could also represent a strong, woman with more “masculine” characteristics than “feminine”. The King gets what he works for and he works hard for it. He’s a caring, kind, compassionate man that gives generously to those who have less than him. When he appears, he can represent the successful completion of a project or business venture. If he doesn’t represent you, he may represent someone you will encounter. Moon square Mars at 3:24 AM PST could bring impulsive, volatile emotions to the forefront. If not checked, these emotions could lead to confrontations. If you’re asleep during this transit, these feelings may appear in your dreams. Moon sextile Pluto at 8:09 AM PST could bring emotional outbursts that clear the air in the end. Moon sextile Venus at 1:48 PM PST will bring love and beauty to your evening. Take time to appreciate the people you love as well as the finer things in life. The Moon is in the volition, secretive sign of Scorpio until She goes void of course at 1:48 PM PST so get any projects you need to start going early and wrap them up later in the day. The number of the day is 2, a number of balance. Mantra: I work for what I deserve. 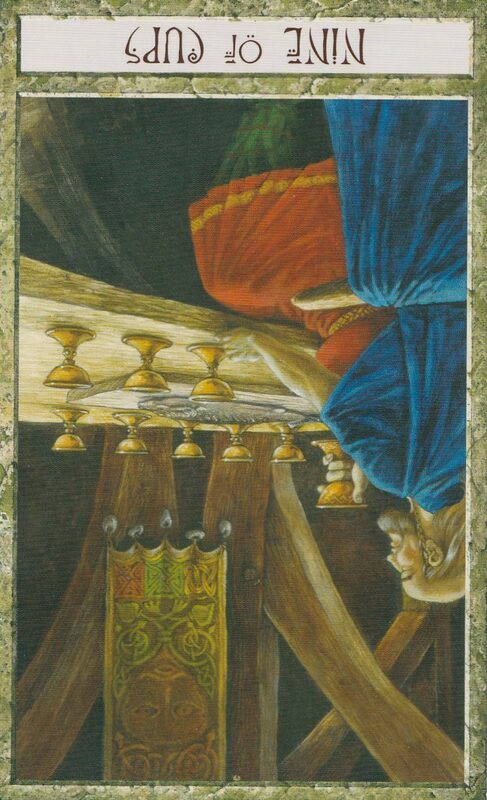 Upright the 9 of Cups is a card of achievement and satisfaction but in the reversed position, the 9 of Cups signals greed and selfishness due to dissatisfaction. The reversed energy of the 9 of Cups plays into deep insecurities; the kind that lead to bullying , discrimination and ego driven crime. Be careful who you associate with today because there’s a bad vibe in the air. There are no direct transits today except the Moon will start the day void of course and enter the cheerful sign of Sagittarius at 12:46 PM PST. However, because of this card, I suspect that the Sagittarius energy will err on the unbalanced side of egotistical and gloating. Check your behavior today and remember to be kind to everyone. However, if you must defend yourself, tap into the confidence of Sagittarius and be assertive but not offensive. You know where your boundaries are and have the right take up for yourself. But if you can’t deescalate things by setting boundaries, be the bigger person and walk away. The number of the day is 9, a number of near completion. 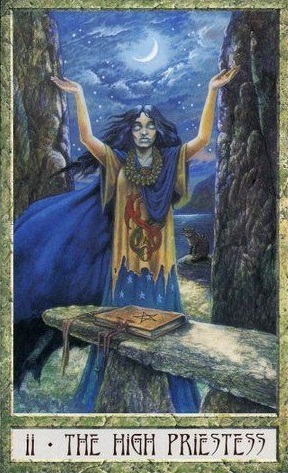 The High Priestess is a card of intuition and knowledge. Go with your gut today and trust that your feelings are right. Moon conjunct Sun at 4:18 AM PST brings the New Moon in Sagittarius. The Mercury Retrograde Pre-shadow period begins Thursday so make sure all the intentions you set are for things that you need to wrap up instead of beginning things. Also, remember that we are wrapping up a 9 year so this is a good time to begin sorting out what you want to leave behind. 2017 is a 1(0) year and the beginning of another 10 year cycle. So use this moon to start taking cosmic garbage out to the curb. Moon square Neptune at 7:26 AM PST could cloud your intuition so refrain from passing judgement at this time. Venus square Uranus at 12:20 PM PST will bring excitement and stimulation through love. You may feel especially flirtatious. Be open to new experiences in love but due to Mercury Retrograde approaching, it’s not the best time to start lasting relationships. Moon sextile Mars at 7:59 PM PST will bring energetic, courageous energy to your evening. Moon sextile Jupiter at 10:20 PM PST will find you finishing off the night with optimism and generosity. The Moon is in Jupiter ruled Sagittarius all day, bringing similar energy. The number of the day is 4, a number of stability. Focus your intentions around bringing harmony and stability to your life through generosity and optimism. 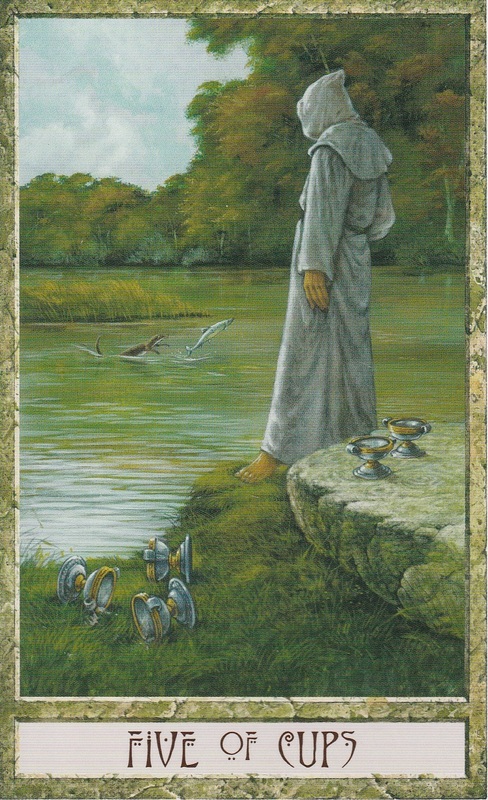 The card of the day is the 5 of Cups. 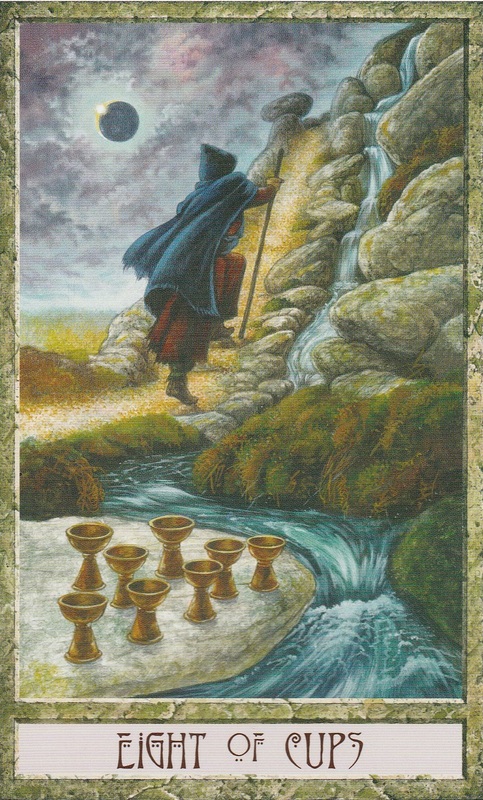 The 5 of Cups is a card of disappointment but not all is lost. Although there are three cups tripped over, there are still 2 standing. Things may not be working out exactly as you planned but there is still more to consider. Moon conjunct Saturn at 12:16 AM PST could leave you feeling lonely and in a downright bad mood. Don’t worry, this will pass. If you’re asleep during this transit, these themes may appear in your dreams. Moon trine Uranus at 6:45 AM PST will bring an adventurous air to the morning. Try something new but nothing too big because we’re entering the Mercury Retrograde pre-shadow period. A new breakfast food or a new coffee shop will do just find to satisfy the urge for adventure. Sun square Neptune at 5:17 PM PST could bring an energy drop that leaves your brain feeling foggy. Beware of those trying to deceive you. Moon conjunct Mercury at 8:08 PM PST will allow you to get your feelings out in the open but you may come off as moody so be careful of the words you use; they’re powerful things. The Moon is void of course until She enters the flowy sign of Pisces at 5:43 AM PST. This is a day where you don’t really have much control over things so you might as well just go along with whatever the day brings and make the best of it. The Moon goes Void of Course at 8:08 PM PST so it’s best to use the evening to wrap things up or simply do nothing at all. The number of the day is 5, a number of overcoming challenges. Mantra: If you feel like you can’t see the forest through the trees, simply just be. 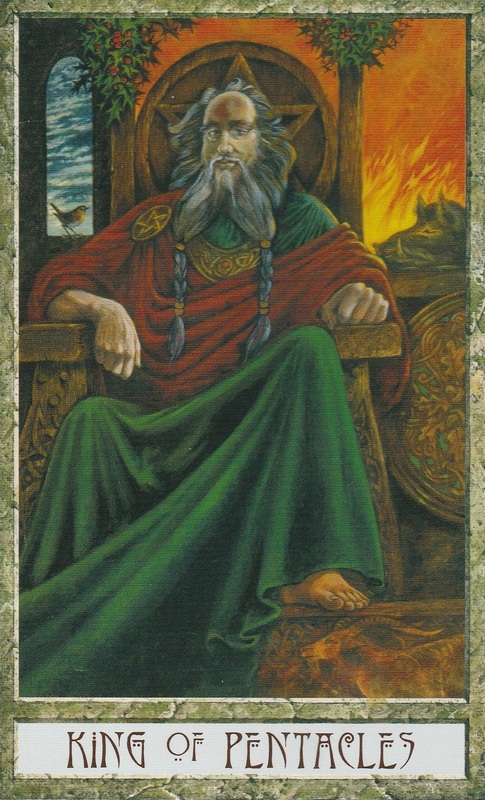 The Strength card appears when you are called upon to tap into your power but not to over exert it. You will be at the center of attention and so use this to your advantage because you will be able to sway the opinions of others if need be. Moon sextile Neptune at 7:16 PM PST will start your morning with a dreamy feeling. This is a very psychic time so trust your intuition. Mars square Jupiter at 7:46 PM PST will bring a special kind of luck to the evening. It’s the kind of luck that not only lets you see your goals but brings the opportunity to obtain them. Under this transit, rest assured that your hard work has been noticed and it will pay off. Obstacles that seemed insurmountable will become nothing but piles of dust under your feet. Mercury enters His pre-shadow period so don’t be surprised if you start to notice disruptions, especially in communication. However. due to the energy of the day, these small disruptions won’t stand in your way. The Moon is in the teacher sign of Capricorn for the day so use any hard lessons you’ve had to learn in your favor. The number of the day is 4, a number of stability. The foundation you’ve built is strong and will not be shaken. Mantra: My weaknesses have become my greatest strengths. The Magician is a card that appears when you recognize the power of your will and aren’t afraid to use it to manifest your desires. Moon conjunct Pluto at 8:27 AM PST could bring intense emotions that highlight overwhelming issues. Let thoughts pass without holding onto them because obsession prevents action. Moon square Jupiter at 10:40 AM PST could bring a smug air to the morning. Celebrate your successes but resist the urge to gloat. Mercury enters Capricorn at 1:19 PM PST where He will stay until 01/05/17 when He moves backwards into Sagittarius. While Mercury is in Capricorn, people prefer things to be orderly and may be skeptical of trying something new. However, with the pre-shadow period energy present and Mercury Retrograde approaching, we may find these effects a little skewed. We may call into question the foundations of what we thought were established and unshakable systems.It may also be difficult to keep track of your money and you may wonder how you ended up spending so much so pay extra special attention to your bank account this holiday season. It may feel like the clock is ticking down, and it most certainly is because the end of the year is fast approaching. Don’t worry, take your time and stay the course. Recommit to goals and stay focused on the climb. Moon square Uranus at 5:57 PM PST could bring rebellious excitement. This will be liberating but also tumultuous and upsetting. The number of the day is 5, indicating shakeups and breakups. The Moon is also in harsh sign of Capricorn, promising that lessons learned today will be remembered. 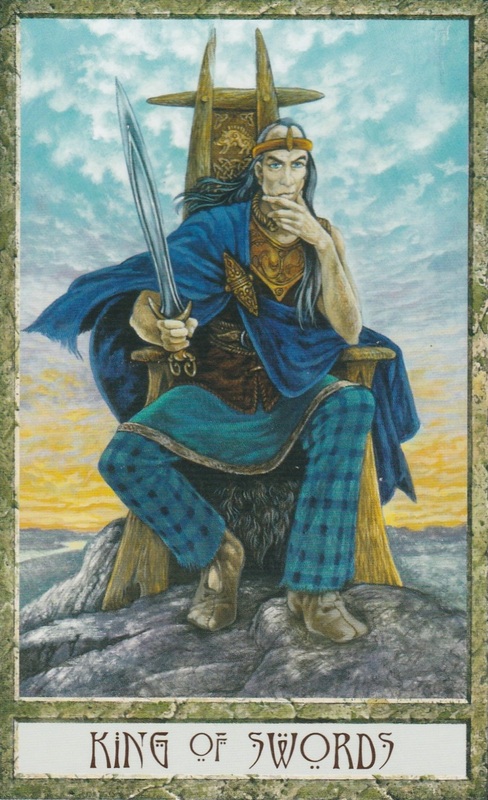 The King of Swords is traditionally an intellectual man who rules over his life with the power of logic although this could also be a woman with traditionally “masculine” characteristics. Skip the heartfelt feelings and talk of intuition when it comes to dealing with the King because nothing will come from it. He demands cold hard facts and strong evidence to get on board with anything presented to him. 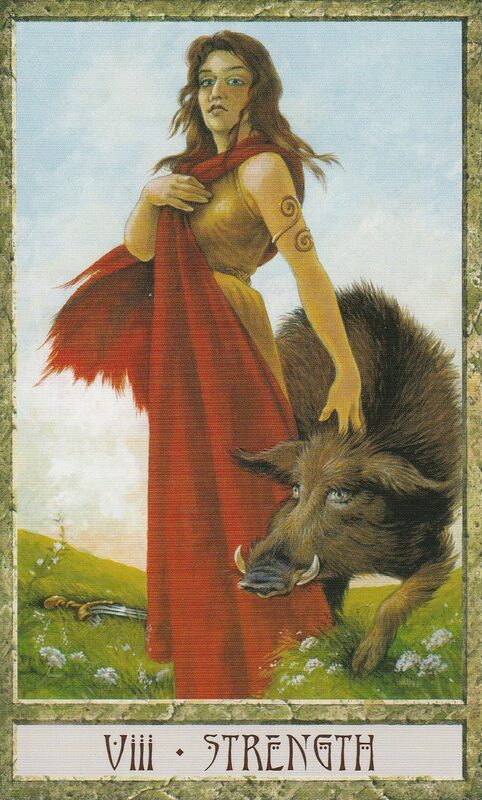 If this card does not represent you, it represents someone that you will meet today. Moon conjunct Venus at 2:16 AM PST will find you feeling social and open to making connections with new people. Mars sextile Saturn at 4:16 AM PST will give you the energy you need to plan and execute projects that require a lot of patience and spartan efficiency. Things should start falling into place from here on out. If you are asleep during these transits, the messages may appear in your dreams. The Moon is void of course between 2:16 AM PST and 11:44 AM PST so take this time to rest or wrap up projects. Then Moon will enter the revolutionary sign of Aquarius at 11:44 AM PST but remember that successful revolutions require a plan, not reckless action for the sake of stirring things up. If you use your head, not your heart, you’ll tap into the vibration of the number 6 day, a number of victory and honor. Mantra: The world only exists in your mind. This entry was posted in Uncategorized and tagged abundance, astrology, card a day, divination, dreams, empowerment, forecast, inspirational, magick, manifestation, mantra, meditation, Mercury Retrograde, metaphysical, motivational, mysticism, occult, pagan, predictions, psychic, self empowerment, self help, spiritual, spirituality, tarot, tarot reading, tarot weekly forecast, wicca, witchcraft, witchy, writing. Bookmark the permalink.